It still has nothing on Harry and Hermione. FIFTY SHADES OF Grey has taken in €1.34 million at the Irish box office over its opening weekend – the highest figure since Skyfall in 2012. 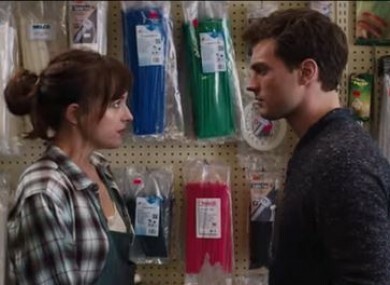 The Jamie Dornan and Dakota Johnson led drama opened on Valentine’s weekend across the island, and its three-day performance has put the film into the top 10 of all-time box office takings. Fifty Shades easily beat last year’s most popular opening weekend – which saw Mrs. Brown’s Boys take in €1.02 million. The film is comfortably ahead of all other 2015 releases, with Taken 3 (€712,061) and American Sniper (€481,322) in 2nd and 3rd place respectively. However, the film’s opening weekend was relatively peaceful compared to other parts of the world. Police were called in at a cinema in Glasgow after a man was glassed. The Mirror reports that he had told a group of loud women to be quiet. Police confirmed that three women had been arrested. Another cinema-goer told the paper that ”there were also several incredibly drunk women vomiting in the aisle and corridor and several complaints from the other screen about drunk and rowdy folk”. Email “Fifty Shades of Grey had the 10th biggest opening weekend in Irish box-office history”. Feedback on “Fifty Shades of Grey had the 10th biggest opening weekend in Irish box-office history”.